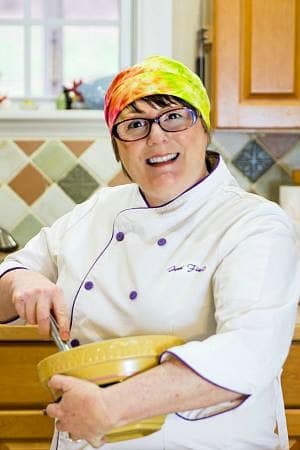 Easter is coming, y’all, and it’s time to make not only some traditional Easter recipes but some fun kid-friendly recipes too! This Easter bunny hill cake is a cute Easter cake for kids your family will enjoy making and eating together! You can make this guy with store-bought cake and frosting or start from scratch with this old-fashioned 1-2-3-4-yellow cake and American buttercream frosting. 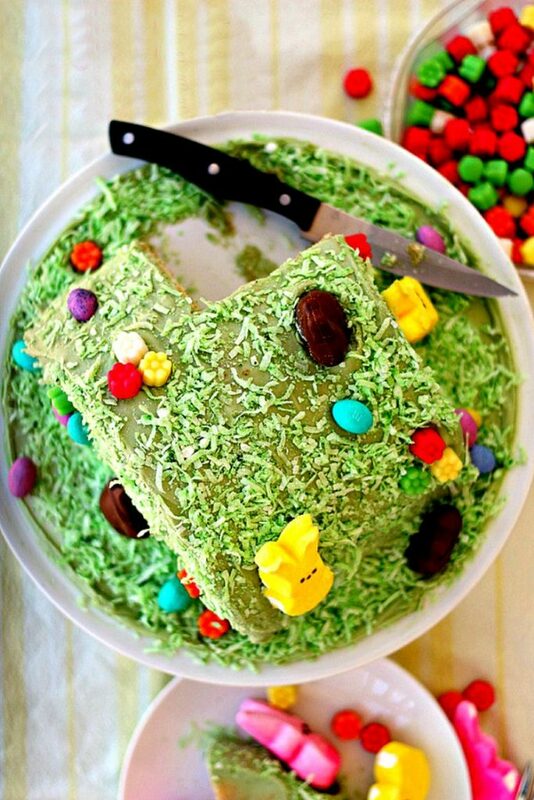 Find more Fun Easter Desserts here, you guys. I went through a phase where I wanted to decorate cakes perfectly. There is certainly still a time and a place for that sort of precision, but today is not one of those days. 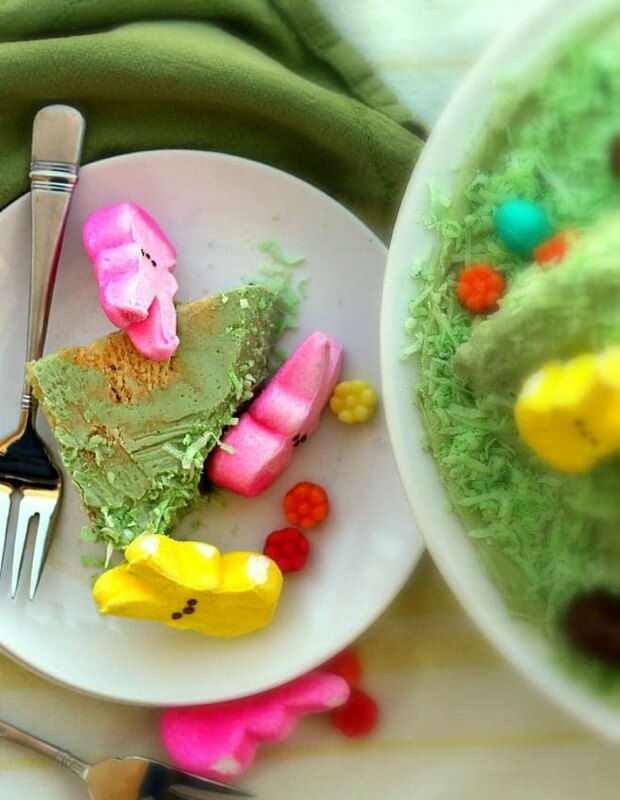 Today is the kind of day that you get in the kitchen with your kids to make a fun Easter centerpiece that doubles as an Easter dessert. Or an Easter dessert that doubles as a centerpiece, depending on how you look at it! Make use of store-bought candy to use as decorations. There is no reason to get out piping bags and make 10 different color icings when you can just place some little malted milk ball eggs, Easter Peeps or other candies and still end up with a super cute cake with way less work. Today, I want to show you how I make an Easter bunny hill cake. It’s not so much about the flavor, although of course you want it to taste good. You can use any flavor of butter cake that you want–chocolate, vanilla, strawberry, carrot cake, red velvet–whatever you like. You can also make whatever frosting you want to as well. I made cream cheese frosting. Do make sure it’s a light-colored frosting because you’ll be tinting it green. Time is approximate and reflects only tinting the coconut and icing, and filling, frosting, and decorating the cake. 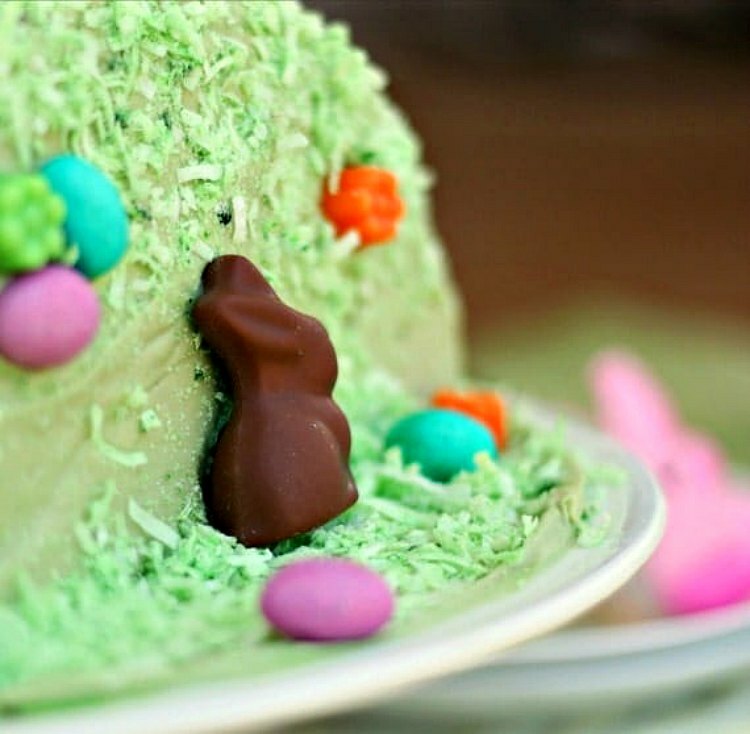 Here’s a rundown of all the steps in making an Easter bunny hill cake, y’all. To clarify, all the steps after you have your cake and icing. This is a great project to do with your kids! Use 2-3 drops of food coloring to get the color green you want. You may need more or less–the amount is up to you. Stir the coloring evenly into your frosting. No need to separate the frosting into different bowls since you’re making all of it green. Sweetened flaked coconut is an easy go-to for grass. All you have to do to dye it green (or any color you like) is to add a couple of drops of food coloring to a large zip top bag, add some shredded coconut, zip up the bag, and then smoosh it around until the color is evenly distributed and your coconut is nice and green. Sandwich your two cake layers together with frosting. Use about1/2 to 3/4 cup of frosting for the filling. Cut the layer cake in half. Slice the filled cake down the center into 2 halves. Plop maybe 1/3 cup of frosting on top of one half of the cake and then stack the other half on top. You will end up with what looks like half of a 4-layer cake. Here’s where your Easter bunny hill cake really starts to take shape! Put the cake on a stand. Place the cake, cut sides down, into the center of a serving platter. Now instead of a half a cake, it will look like a hill in the middle of your plate. Frost the cake and the platter. Use the rest of your frosting to frost the cake. Make sure you leave enough to add a thin layer to the platter. Then it will look like a hill in a green field of grass as opposed to a hill in the middle of a shiny platter. Spread the green tinted coconut onto the platter and over the cake. Use your hands to gently press some coconut onto the sides of the cake as well. Use whatever candies you desire to decorate your cake. I used malted milk eggs, chocolate bunnies, little flower candies, and Easter peeps to decorate my Easter bunny hill cake. Use whatever candies you think will look best. Scroll down to the end of the post to see a video of me doing these steps. It should be helpful for more visual learners. This cake gives you an easy way to make a cute Easter cake with no need for fancy cake decorating skills. 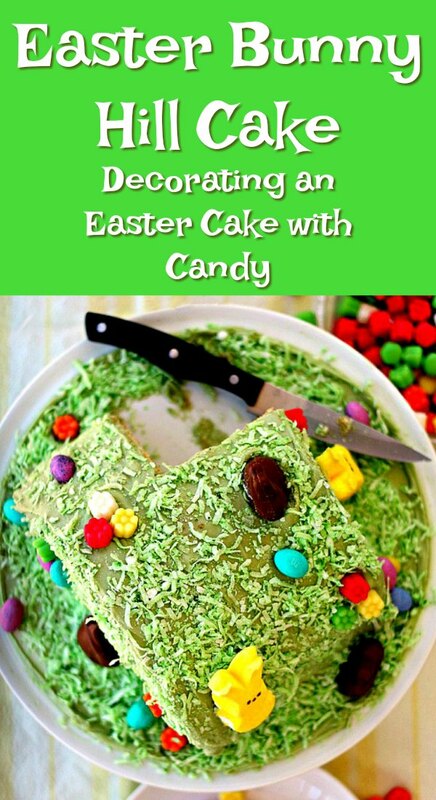 If you can use a knife and slap some icing on a cake, the decorating practically takes care of itself with some strategically placed Easter candies! This section contains affiliate links. For more information, please see my disclosure policy. assorted Easter candies of your choice Easter Peeps bunnies are an especially nice touch since they come in so many flavors and are the perfect Easter candy! This is a wonderful project to do with children. Depending on their age and their skill level, they can help make the cake and frosting and/or ice the cake and/or place the decorations wherever they want. I also love the idea that the Easter Bunny Hill Cake can serve as a festive centerpiece on your Easter table. When dinner is over, you can serve this guy for dessert! Thank you so much for taking the time to read today. I hope you and your family have a wonderful Easter! If you do make a version of this Easter cake for kids with your family, I’d love for you to swing by and share it with me either via email or on the Pastry Chef Online Facebook group page. I just found this really cute Easter bunny cake made using the same technique of cutting a layer cake in half and stacking it. All the Peeps! This was so much fun to decorate, and a completely stress free way, too, so bonus!